From Asbury Park NJ to Coney Island NY and everyplace in between! See the "Disney" category for Disneyland and Disney World. 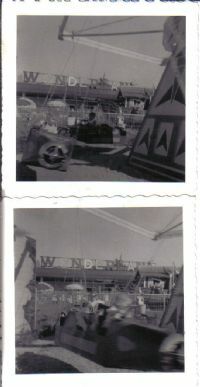 Here is an early Monorail type attraction at Wildwood By The Sea! It looks 60's vintage, and is a Disney type monorail that runs on a track. It actually goes out over the ocean. 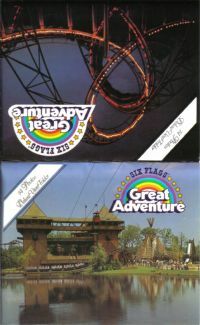 The sky ride can be seen at left. A neat amusement attraction image! Back is divided and unused. Condition is excellent! #64 Embossed Coney Island Dreamland ! Here is an unusual Coney Island card! Its highly embossed! It pictures the famous Tower at Dreamland Coney Island. A beacon at top shines a light in the distance. A super view! Back is undivided and postmarked "Oct 4 1907 Brookly NY" and has a "Station C" flag cancel. 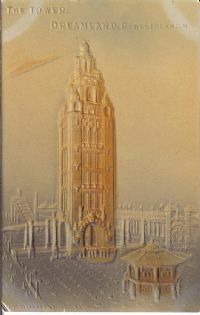 Condition is fair to good with two album marks at top as shown and a small crease at lower left corner. A neat piece! #111 4 Roller Coaster Postcards ! 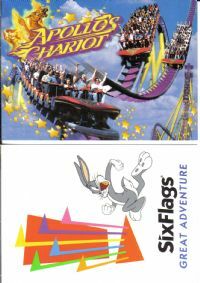 Here is a nice group of roller coaster postcards! Each is an oversized postcard. 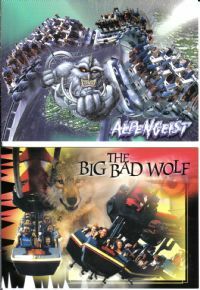 Included are: Apollo's Chariot Bush Gardens Va., Six Flags Great Adventure NJ, Alpengeist Busch Gardens Va., and Big Bad Wolf Busch Gardens Va. Condition is great on all!